Pertamina EP Asset 3 Subang Field as one of the oil and gas production companies that operates in Karawang Regency is obliged to carry out social responsibility to the surrounding environment, including in the field of education. Based on this, PT Pertamina EP Asset 3 Subang Field together with Assolahiyah Foundation-was one of PT Pertamina EP Subang Field Corporate Social Responsibility Program that are already Independence-create an environmentally-based early-childhood education program as a media for children to learn more about their environment. This program is implemented in PAUD Alam Al Firdaus which is located in Muktijaya Village, Kecamatan Cilamaya Kulon, Kabupaten Karawang. Good education always starts with competent and skillful teachers. The program also aims to promote environmentally-based entrepreneurship to the children. Through environmentally-based education for the community in the company’s operational area, it is expected that the surrounding environment becomes clean, healthy, and comfortable so that the company’s operational activities can run better. PAUD Alam Al Firdaus is an early-childhood education center (school) that focuses on environmental education. In this school, the students are taught to learn more about, to care, and to love the environment in a fun way through exciting activities. The activities in this school have gradually change the mindset of children. At the very least, they are aware to always throw the waste in the waste bin and are able to differentiate organic and inorganic waste. The character building that becomes the main point of this school aims to generate agents of change who care about the environment. This program is implemented in PAUD Alam Al Firdaus which is located in Muktijaya Village, Kecamatan Cilamaya Kulon, Kabupaten Karawang. Good education always starts with competent and skillful teachers. To start with, the teachers’ capacity on environmental education was built and developed to provide initial understanding on environmental education that had never been applied and taught previously. Capacity building for teachers is conducted by benchmarking to other nature school, based on reference from the Ministry of Education, specifically from the Department of Early-Childhood and Community Education, which is located in West Java Province. Besides improving the capacity of teacher, school managers also collaborate with relevant government agencies, which is the Environment Office of Karawang Regency to improve teachers’ understanding on environmental issues. to introduce the utilization of recyclables. Our program is based on character education for children 3-5 years old. The change of mindset is not an instant process. A continuous and persistent behaviors need to be maintained in order to shape the mindset on the importance of environmental cleanliness. The substances and practices given in teaching materials is also expected to help shaping the love and respect mindset towards environment. The guardians are enrolled in the vocational training in which they learn how to process the recyclables into products that have economic value, such as making bags from coffee sachets, making handicraft from old newspapers, etc. Through these skills and knowledge, the guardians are gradually become more considerate to the waste in their surroundings. The change is noticeable. When they find recyclables on the street or in other place, they will pick it up and then collect it to be saved at school later. Students start to consider waste as something that has economic value. They start collecting the recyclables when they see scattered waste and then give the recyclables to their parents or store them in the charity box at school. Since January 2018 up to today, the school have collected about 380 kilograms of recyclables that consist of plastic, cardboard, paper, cans, etc. This awareness, which is the main objectives of this program, is gradually emerging. It is important for the students and their guardians to have such awareness and environmentally-based mindset as they will disseminate this to the whole society so they can have a better life gradually. The expansion of these activities can be easily implemented in other areas if the introduction is properly given in the first place. The socialization conducted by PAUD managers is expected to spread positive energy and spirit to care about the environment to other school so that new agents of change in the environmental field can be generated. 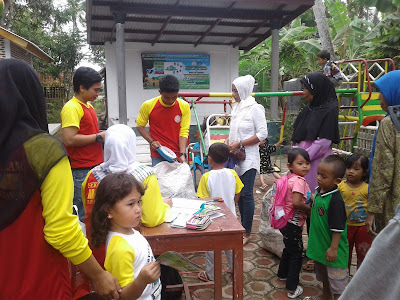 This program has been socialized at 4 Early-childhood School and this program has been replicated in Al Bayan School located in Pasirukem Village, Cilamaya Kulon District, Karawang Regency. Sincere and spontaneous activities of the community show that they understand the importance of environment sustainability and are able to give contribution to help the government in coping with the waste issue. They realize that this is only a small step but they are ready to become agents of change in the field of environment. This optimism also encourage school managers to disseminate such positive activities to other schools in order to generate a more significant results. The roadshow activities conducted by PAUD Al Firdaus management aims to transmit positive energy of environmentally-concerned mindset to other children in neighbouring villages. The exciting activities in the school have attracted more students to enroll in PAUD Alam Al Firdaus. In 2017, there are only 25 students while in 2018 the number of students are increasing to 50. Since January 2018, more than 150 children, age 3-5 years old, who get the socialization of waste and environmental attitude and apply it in everyday life. The main activity of this program is to build the character that love and respect the environment and to make children realize the economic value of waste. In 2018, school managers implement the “School that Accept Waste as Tuition” (Sekolah Berbayar Sampah) action. Teaching and learning activities in PAUD Al Firdaus was previously free of charge except for school equipments and study tours. Through “School that Accept Waste as Tuition” action, students will be able to use their waste savings to pay for their study tours, buy school equipments, and save in their guardians’ waste savings. This action raises a new understanding among students and their guardians to appreciate the economic value of waste by not littering and keep the the waste in their savings. A better attitude towards waste is a fundamental character for students and their guardians in this learning activity. In this school, waste is collected every friday. All types of waste are acceptable except for sanitary napkins and diapers. Before the waste stores to school, the students and guardians were previously taught how to sort the waste. By knowing the waste segregation, it is expected that the students and their guardians can identify various types of waste and can distinguish the waste that has economic value or are recycleable. Other activity offered in the program is Waste Charity (Sodaqoh Sampah). This activity aims to spread the spirit of caring and sharing with others. The sense of belonging to the environment is the sign of growth and is expected to be a habit that remains and applied in their daily life. Particiants of this activity is not only limited to students, guardians, and school managers. Other residents in the area can also participate in this activity. There is a charity box placed outside the school in which anyone can store plastic bottles that will be cashed out and the money generated will be donated for educational activities. PAUD Alam Al Firdaus does not work alone in implementing its programs. There are several related institutions or agencies that help and support the sustainability of the programs. 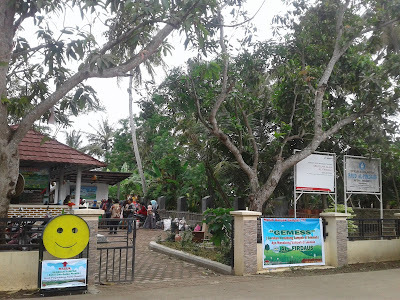 PAUD Alam Al Firdaus cooperates with non-government communities (KSM), which are specialized in the field of waste collection and processing in Karawang regency. The waste collected by students and parents are then transported and purchased by KSM to be taken to Pulojaya temporary shelter (TPS). In this shelter, recyclable waste will be processed, while non-recyclable waste will be taken to Jalupang’s landfill (TPA). Some of the recyclable waste will be separated by the school to be used as teaching materials for the students and their guardians. This activity is expected to change the mindset of students and guardians in particular and the village community in general about the importance of maintaining the cleanliness of the environment. If it is implemented in a long run, this activity will have a major impact in the future. According to education authority office in West Java, both the Ministry of Education and the Ministry of Environment do not have an environmental education curriculum for early childhood education, currently. Therefore, PAUD Alam Al Firdaus in cooperation with the Environment Department and Education Office of Karawang Regency prepare an environmental education curriculum for early childhood education. 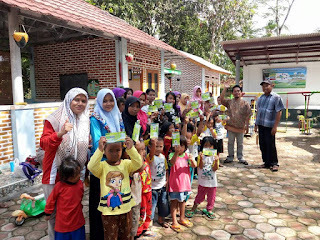 It can be said that PAUD Alam Al Firdaus is the initiator of environmental education for early childhood in Karawang Regency even the first in Indonesia. In the future, this curriculum will be patented as the compulsory curriculum for PAUD schools. The company’s roles in this program are to conduct monitoring, mentoring and evaluation together with the Assolahiyah Foundation. Government agencies such as local offices and administrations act as advisers and coaches to the ongoing activities. The offices also participates in conducting joint evaluations with the company to measure the progress and the success rate of this program. Non-government Communities (KSM) act as partners in waste collection activities also as adviser who share their knowledge and experience on waste processing.